Dr. Mark Hannah graduated with a Bachelor of Science degree in Biology from Saint Joseph's University in Philadelphia, Pennsylvania in May of 1981. He then was accepted into Georgetown University School of Dentistry in Washington, D.C., and graduated in May of 1985. During his education at Georgetown University Dr. Hannah did an internship at the Gorman Dental Clinic at the Georgetown University Hospital. At that time, Dr. Hannah practiced in the Dental Clinic that was the covering clinic for the Dental School. Emergency patients were treated for a broad spectrum of immediate needs dental care. Dr. Hannah is an active member of the American Dental Association, the Academy of General Dentistry, American Academy of Cosmetic Dentistry and the Monmouth-Ocean Dental Society. Dr. Hannah is also a member of the International Congress of Oral Implantologists and has recently received his Fellowship. Dr. Hannah has been in private practice for over twenty years. When not practicing dentistry, Dr. Hannah spends time with his wife, Katherine and three sons, Marcus, Jared and Andrew. He is an avid tennis player, skier and pianist. 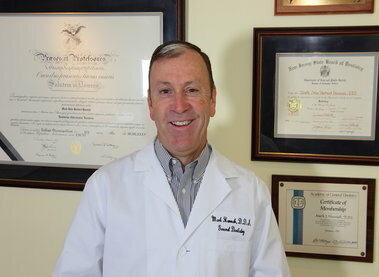 He resides in Manasquan and has always sought to maintain a local solo dental practice at the New Jersey Shore.